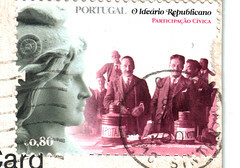 A Postcrossing post card from Vitoria in Portugal. 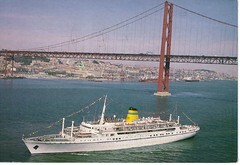 Funchal was originally built in 1961 to cruise between Lisbon, Madiera and the Azores. At 153m in length, she’s much smaller than many of today’s cruise ships, but she still has all of the essentials, including two restaurants, three bars, a theatre, a library and a casino. She can accommodate over 400 passengers, and regularly cruises around the world during the Northern winter. Thanks for the lovely postcard, Vitoria! Next Next post: "The sunset at River Kwai Bridge, Khanchanaburi"